How to Stage Your Own "Surveillance Camera Theater"
SOUTH SAN FRANCISCO, CA (KGO) -- The mayor of South San Francisco's message to those captured on red light cameras at two heavily traveled intersections in the city before Jan. 27 is this: Don't pay your ticket! "We don't want any more money to refund, so please don't pay your ticket." That is South San Francisco Mayor Mark Addiego's answer to drivers who were nabbed by red light cameras in the city between Aug. 15 and Jan. 27. If you have already paid your ticket, the mayor says you will be reimbursed. "The ratification of the contract somehow fell off the radar," Addiego said. "It could range up to $50,000 to undo it, just administratively with manpower," Addiego said. Annalyn Chacon was caught on camera twice just one month after she moved to the area. Both times Chacon was making what is called a "California stop," a rolling stop as you make a right against a red light. The tickets have cost her almost $900. "I know it's a big revenue line for the city, but it doesn't seem responsible," Ault said. "I don't think they rise to the same level as someone who blows a red light, so I think we need to look at the red light cameras for right turns versus through the intersection," Addiego said. UTAH - House committee approved legislation Friday that would prohibit the state from complying with provisions of the federal REAL ID Act, a measure supported by both the American Civil Liberties Union and the Utah Eagle Forum. "What [REAL ID] could ultimately lead to is a national ID card that could lead to all sorts of government tyranny if it goes too far," said Rep. Stephen Sandstrom, R-Orem. The worrisome provisions include the addition of radio frequency chips set into the state's driver licenses that Sandstrom said "could lead to tracking of movements of individuals and could be used to track the purchases of things such as ammunition and guns." Congress passed the REAL ID Act after the Sept. 11, 2001, terrorist attacks to impose uniform standards on state identification cards. The bill would not repeal the portions of the REAL ID Act that have already been enacted, including the requirement that residents provide a birth certificate to get a driver license. This Monday (8th Feb) the Identity and Passport Service (IPS) began the next phase of the ID Card Con - targeting 16-24 year olds living in London. Minister for Identity, Meg Hillier invited the media to come and see the first 'volunteer' be fingerprinted at 8:30am. A dozen or more hardy NO2ID supporters mounted a chilly white protest in biting winds and the odd flurry of snow outside Victoria passport office. IPS security decided to stay in the warm, and keep an eye on us through the window. Getting there half an hour before the minister meant we caught the media going in - and also coming out. Phil Booth gave interviews to ITV news and the Press Association cameras, and reporters from several London university newspapers. Guy Herbert spoke to news radio. Inside the passport office, according to one person watching, the volunteer actually referred to himself as a guinea-pig. Shame he didn't get the full message on the flyers we were handing out, which is *don't* be a guinea-pig. Glimpsing Ms Hillier through the glass around 9:30am, we rapidly relocated our protest round the corner. But to no avail. The Minister snuck out another way, leaving another decidedly low-key media event without directly engaging her critics. OKLAHOMA CITY -- An Oklahoma lawmaker is calling a piece of legislation under consideration in the U.S. Congress a "big brother, big government bill." The Pass I.D. Act calls for standardizing driver's licenses across the country, but State Representative Paul Wesselhoft says the bill is an invasion of privacy. "I think it's big brother at its worst. I know the motive behind it is to curb illegal immigration and other security issues but I think it's a violation of our 4th Amendment," says Rep. Wesselhoft (R-Moore). Representative Wesselhoft believes the Pass I.D. Act could give the government unprecedented access to your personal information through your driver's license. The republican claims there's a provision in the bill that calls for ID's like licenses to carry radio frequency identification chips. "They could embed that with a chip, they can track you and find out not only where you are, but who you are," says Rep. Wesselhoft. The U.S. Senator from Hawaii who is sponsoring the act says that's just not the case. We contacted Senator Daniel Akaka's office; his staff told us the bill implements the 9/11 commissions requirements for driver's license security. In a written statement, the senator's office says: "Neither REAL ID nor PASS ID call for computer chips of any sort. As recommended by the 9/11 commission, the existing REAL ID regulations require IDs to contain machine readable barcodes much like you would find at the supermarket. Police officers can scan the barcodes to easily verify the information printed on the front of the ID and detect fake IDs. Many states have been using the barcodes for years." Despite what the congressman's office told us, Representative Wesselhoft says there is language in the bill that could allow for computer chips in driver's licenses. The representative is now proposing a new bill aimed at protecting Oklahoma driver's licenses from government intrusion by preemptively disallowing state and local governments from tracking a persons location or obtaining personal information from an individuals driver's license. This week we're back to our regular news magazine reporting and commentary format. THIS WEEK'S DIY GOVERNMENT: Downsize D.C., proud sponsor to comprehensively repeal the Real ID Act so there is nothing left for Joe Lieberman to cling to, supplements FARFA's work with an online campaign. BUZZWORD: "Intervention" preferred to "revolution". FEATURED GUEST: Filmmaker Tim Jackson discusses the history and art of the political prank exhibited in his film Radical Jesters. Politics tends to be rough and intense waters, which makes it prime real estate for the comic and satirical humorist. Much of dissent in the form of direct action has become criminalized. (i.e. It's illegal to stop traffic by stepping into the streets during business hours with intent to assemble for purposes of demonstrated protest.) The last bastion of dissent is to get really creative using what you know, who you are and what you have on hand. San Francisco - Today a federal appeals court rejected a government claim of "lobbyist privacy" to hide the identities of individuals who pressured Congress to grant immunity to telecommunications companies that participated in the government's warrantless electronic surveillance of millions of ordinary Americans. As the court observed, "There is a clear public interest in public knowledge of the methods through which well-connected corporate lobbyists wield their influence." BTC - Someone wants to see your citizenship papers if you are going to own a home. Washington, D.C. - February 5, 2010 - (RealEstateRama) — Congressman Kenny Marchant (TX-24) issued the following release today after unveiling his new bill, H.R. 4586 the Mortgage E-Verify Act. BTC - GUESS WHAT? 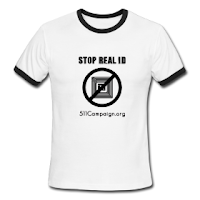 The 10th Amendment strategy works.... on Real ID... again. 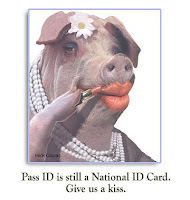 Real ID created national standards for driver’s license and identification cards and opponents have been resisting it for various reasons – it’s a privacy risk, forces states to bear the financial burden, and is not authorized by the constitution. The Utah legislature passed House Resolution 4 (HR4) in 2009, which was a non-binding resolution making clear that the legislature opposed the law. Supporters of HB234 see it as a logical follow-up to the resolution passed last year. States were originally given until May 2008 to comply with the law, but widespread resistance resulted in the Federal Government changing that deadline not once, not twice, but three times. More than two dozen states have passed resolutions or binding laws opposition the act, rendering the Bush-era law nearly null and void in practice. Michael Boldin is the founder of the Tenth Amendment Center. He was raised in Milwaukee, WI, and currently resides in Los Angeles, CA.